Class IV data center, the highest level currently available. In testing our Act! Cloud Hosting Platform is 3 times faster than Swiftpage/Act! provided hosting. Call 214-219-8607 Act! hosting services provided by Computer Evaluations is an effective way to have access to your Act! data without your having to have an IT infrastructure such as servers, power backup, data communications “pipelines” or support personnel to ensure database backups or fix the occasional “glitches” that can happen with any computer program. 1. Internet web access from any PC, iphone, ipad or Android device using Firefox, Internet Explorer, or Chrome for Act! Version 16 and newer. 3. A combination of both methods where some users have access via Sync, web, or both. Web users can log into their master database from any computer with internet access for live, real-time access to their data (or sub-set), while the Synchronization method has Act! installed on each user’s workstation, and can provide different sub-sets of your database to different users. After initial installation, each user can initiate a sync with the cloud server automatically as often as is needed to have the most timely data available. (We recommend every few hours to minimize sync packet size and sync times) Because sync users have a copy of their data, they can access it any time, even when the internet is not available, such as on airplanes or while outside of your office or hot spots. In exchange for the hosting service fee, we include daily backups; access-related tasks, such as adding/changing user access; re-creating remote databases if necessary; manage users (add, delete, change security role, team membership, allowed user features, passwords); manage synchronization (create replacement remotes, manage remotes, create/change sync sets and provide sync database reports as requested), and minor field additions/changes to your database. 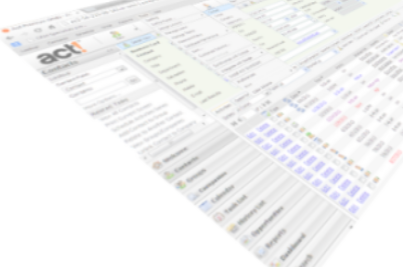 Additional tasks we provide on a fee basis include database customization by adding/deleting fields and drop-downs (five changes per month at no charge), Additional user licenses, new report creation, training, Act! sync remote upgrade installations, or other Act! support services, as requested. Should you prefer hosting by Act!, Computer Evaluations also offers direct Act! Hosting, which has a one year annual agreement, minimum of three users, and provides both web access and synchronization, but does not support custom tables or reporting dashboards. * Act! Web Premium license not included. On-line access from a MAC via Chrome browser, or Safari with v20+. Off-line access from a MAC requires Parallels, VMware or Dual Boot. ** Free 30-day hosting trial limited to maximum of 3,000 contacts. Act! license not required for 30-day trial.